PLT Energia, an Independent Power Producer (IPP), is already producing 80 MW of wind energy in the South of Italy and has been in the business of renewable energy for years. PLT Energia and VERGNET signed a frame contract to install eight VERGNET GEV MP C wind turbines in Calabria where they are producing electricity locally. Depending on wind measures, PLT Energia and VERGNET installed 5 GEV MP C (55 height with guy wires) and 3 GEV MP R (32m height with monopole tower). 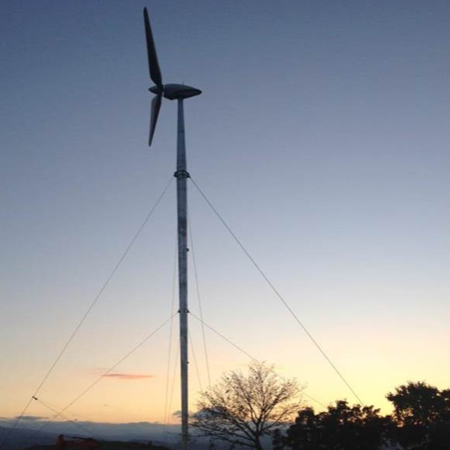 The first Italian VERGNET GEV MP C wind turbine was installed at Monaci in Petrizzi, Calabria, at the Southern top of Italy. It is one of the few of its size, with a total power of 200 kW and a yearly output of 357 MWh with an availability of 99.17% (in 2014). The project presented a challenge for Vergnet, with a tight project completion deadline of just over two months between order date and commissioning, in order to ensure the installation of the turbines before the change of FIT in Italy on 31st December 2012. With over 25 years’ experience in delivering projects for isolated environments with extreme climatic conditions and limited electricity infrastructure, VERGNET’s experienced engineers adapted the system and the project specifications to meet the site requirements and conditions within a short timeframe. With a rapid project delivery time, Monaci quickly benefitted from the additional resource of a wind turbine to diversify power supply and contribute clean, renewable energy to the site. The muddy conditions of the site and harsh winter weather presented challenges for the installation of the Monaci wind turbine, however, we were delighted to turn the project around from the date of order to the final commissioning in just over two months. Over 25 years, Vergnet has had a large amount of experience in delivering and adapting systems to meet site requirements within difficult conditions. Vergnet understands the importance of commissioning projects, such as the Monaci wind turbine, within a short time frame to ensure the turbine contributes clean, renewable energy to the site and society can reap benefits from the project as soon as possible.